MOST RV OWNERS who travel off the beaten track for long periods have a common problem: they need to keep an auxiliary battery (or batteries) charged to power a fridge, lighting, water pump and probably a 12V TV and a laptop. The tow vehicle already has its own charging system with the alternator. And many 4WDs are fitted with deep-cycle (DC) auxiliary batteries that are recharged when the vehicle is driven, and can continue to run a portable fridge for two to three days (depending on the ambient temperature and temperature setting) when the vehicle is idle. Similarly, many motorhomes, caravans and camper trailers are equipped with their own DC auxiliary batteries, which are recharged via the tow vehicle. But even if you run your built-in fridge off gas, which is the most efficient way, the power you need for lights, pumps, and even the spark to light your gas stove, will dwindle unless you can return some power to the RV’s battery. So if you plonk down in the one beautiful, unpowered spot for more than a few days in summer you’re going to lose your cool unless you have a device to recharge your DC batteries. This inevitably leads you to a crossroads decision between a petrol or diesel-fuelled generator and solar power. The generator is the simple, reliable and very cost-effective solution. From less than $1000 to around $2000, depending on brand and power output, you can purchase a pure sine wave unit that will not only power your fridge, but luxury items like an air-conditioner and microwave. You just fire it up, plug in your appliances and, hey presto, instant, abundant power. But even the quietest and most modern generators can be relatively noisy in the pristine silence of a national park. In fact, they are banned altogether in many parks, or can only be used for limited hours (unplugging your freezer overnight is not such a great idea). And if you are a serious wildlife photographer, you may find they scare away the birds and other animals. 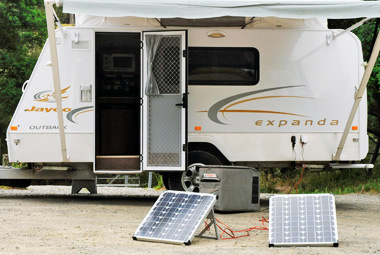 The clean, quiet alternative is solar power, either through a single or series of panels fixed to your RV, or portable panels that can be positioned to best catch the sun. In terms of bang for your buck, solar panels don’t compare with a generator, and a solar system of corresponding output will weigh a lot more than the equivalent generator, so don’t look for any savings there. The other thing to consider is that even if you get sunlight every day, the quality of that light and how much power it can send back to your battery via a panel, varies throughout Australia. Atmospheric pollution in cities, dust in the outback, cloud cover, shade from trees and the time of the year, are all factors. On the positive side of the ledger, however, solar systems require no fuel, don’t wear out mechanically – many panels up to 25 years old are still operating effectively, provided that they are kept clean – and they are totally silent. And if you want further justification, solar power is a one-off investment that involves no further running or maintenance costs. While 240V appliances can be plugged directly into a power generator, solar panels are designed to replenish the batteries, which in turn run the appliances. A charged battery will run 12V appliances directly, but 240V appliances must run through a power inverter matched to the amperage required by the appliance. Typically, solar panels deliver more voltage than the battery can accept, and therefore need a regulator to control the power that your battery needs to recharge. The regulator should ideally be located closer to the battery than the solar panel for two reasons: it will be more efficient if kept out of the sun; and the shorter the connection between the regulator and the battery the less chance there is of voltage drop, which could affect the battery’s ability to re-charge. If you are trying to run any form of heating device – hot water, oven, etc., – solar is realistically a waste of time and money. However, solar does work very well when you are charging batteries and using high efficiency products on the other end. The past 20 years have not seen solar panels become more efficient, but rather the products we run off them. In the past, a van’s main light source would have been a 12V incandescent globe, but today we have 12V LED and fluorescent lighting that use a relatively tiny amount of energy. A modern, well-designed electric compressor-driven refrigerator is similarly ideal to run off solar power, while a modern water pump can be used quite effectively for short periods to deliver water to a tap or shower. So if you have the right uses, solar becomes a very cost-effective and sensible option. But if you want to run an air-conditioner or other heavy-duty appliances, you might as well bite the bullet, buy a generator and accept that your access to some areas may be limited – or you may not be very popular with your neighbours. A solar panel (or photovoltaic module) is a series of individual solar cells connected together to make up a large panel. Each cell is typically made from silicon, which turns UV light into electricity. Solar panels usually have a toughened glass protecting the solar cells and are typically impact resistant. Basically, the sun hits the silicon wafers and is turned into electricity. That electricity is then sent through the wiring in the panel to the battery, via a regulator. If you go down the solar path you will be confronted with a bewildering choice of models and sizes, all with differing outputs using three different technologies. Solar panels are rated by their wattage, so a 50W panel is rated to output that wattage in an hour of good of sun. Australia averages four sun hours per day, so a 50W panel theoretically outputs 200W per day. The following examples show how to determine the solar power required to maintain a battery running a 40L Engel fridge in varying circumstances. 3. Useable amps multiplied by sunlight time = total amps supply. So, a 50W panel divided by 12V gives us 4.1A. Those 4.1A, minus 10 per cent, give us 3.6 useable amps. Those 3.6 useable amps multiplied by hours gives 21.6 useable amps in 24 hours. This means our 40L Engel fridge could run for 10 hours using a total of 22A. If we take a typical situation of approximately 10 hours of useable sunlight during the day, a 60W solar panel and a 40L Engel fridge, we would have 45 useable amps over a 24-hour period. This means the same fridge could run for 20 hours using a total of 44A ­– double the time. With an average ambient temperature of, say, 25°C, the same fridge will maintain a temperature of 4°C for about 10-12 hours of compressor time, and will draw 2.2 amps per hour of operation. So it will consume about 26.4A in a 24-hour day to keep your meat refrigerated and your beer cold. This will leave you with ample battery capacity for lighting and to run your van’s water pump and TV. If the weather is scorching, your fridge will have to work harder and draw more power to maintain the same temperature. And if that solar panel is fixed to your RV’s roof, and is shaded for part of that time, you will have less power going back into your battery. This could mean a net power loss. However, if you have a portable 50W panel and you reposition it twice throughout the day to ensure it caught the sun from an optimum angle, you might get 8-10 hours of peak power from it, so you would be fine. Of course, that is assuming optimum sunlight. Most solar panel experts, like Alan Johnson of Melbourne offroad specialist, Piranha (who provided the above calculations), recommend 80W as a better proposition if you are limited to one set of fixed or portable panels. But, Alan argues, why not hedge your bets and have both? “The problem with a roof-only fixed system is that you need to park in the sun to get the most out of it, and in central Australia that’s often not a great option,” he said. “If 20 rigs come into a camping area you can always bet that there will be a race for the shade. “However, the problem with relying on a portable system is that you have to be there to move the panels to get maximum power, and if you are away for the day you are leaving an expensive accessory lying around. If I was setting up a solar system for a caravan or an RV, I would consider having one 50W panel fixed to the roof and have another I could move around. To add further confusion, there are three types of solar panel on the market applicable to caravans and RVs: polycrystalline; monocrystalline; and amorphous. All three have been in Australia for many years. Monocrystalline, made from single crystal silicone, came first, but in the ’90s an Australian company developed a way of multi-layering the crystal wafers that allowed the panel to become smaller for a similar output. Called polycrystalline, this technology features panels that are able to absorb more energy for a given area. Both monocrystalline and polycrystalline are available in a range of similar outputs, are similarly rugged and are competitively priced. However, if you have to choose on the basis of size for watts, or you want the panels to operate in very high temperatures, polycrystalline will probably be your better bet for an RV, although monocrystalline panels are slightly more efficient. The third type of solar panel is called amorphous. The main difference in this type of panel is its flexibility. It folds away like a blanket and can be draped over a caravan or an awning. It can even be walked on. But to achieve the same output as a monocrystalline or polycrystalline panel, the blanket becomes enormous and the cost per watt ratio is much higher. For example, a 30W amorphous panel will cost around $700, and a 50W panel around $1100 – nearly double the equivalent rigid monocrystalline or polycrystalline panel. However, they have their advantages. For example, a small blanket could be rolled up and carried in a backpack to recharge a satellite phone or camera batteries. Or it could serve as an emergency battery charger for a trail bike if you were travelling in a remote area. If you want to run things – not just top up a battery – you need solar panels with a minimum of 80W, up to a maximum of around 300W. As these panels usually come in 50, 80 or 100W modules, you simply buy as many as you need. As a rough guide, a good quality fixed 50W monocrystalline or polycrystalline panel with a 20-year warranty will set you back around $600; a portable kit model of similar power costs around $800. But remember that with a fixed panel there will be a fitting and wiring cost. Of course, if you have unlimited money, or a particularly green conscience, you could cover the roof of a bus or large motorhome and its verandahs with enough panels to power just about everything from an-air conditioner to a washing machine – for around $20,000. Source: Caravan World Feb 2011.